The repeater extends the ZigBee radio network. 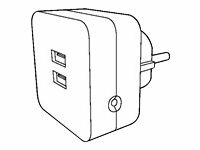 A ZigBee device, for example a smoke detector, does not necessarily have to be inside the Smart Home gateway or QIVICON Home Base direct range; the presence of one or many repeater/s or Smart Plug/s between the device and the station is enough. In order to activate the signal repeater function, the device must be connected to the Smart Home system. You do not require any additional setup.Thanks to the repeater, it is possible to charge USB devices, such as smartphones or tablets, through a USB cable. The maximal power of the 2 ports is 1.5 A. The charge function does not depend on the connection to the Smart Home system.